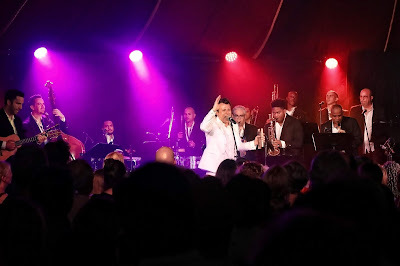 Sydney Festival with Daptone Records, present, ORQUESTA AKOKAN, in the Magic Mirrors Spiegeltent Festival Garden (Hyde Park) 15 and 16 January. ORQUESTA AKOKAN, is a big band mambo collective, comprised of some of Cuba's finest musicians and others from New York, celebrating Havana of the 1940's and 50's. The band is led by Cuban singer Jose 'Pepito' Gomez and piano player Michael Eckroth and Jacob Plasse featuring a crack brass section. The Spigeltent had had all its furniture cleared and we entered into a 'mosh' pit style accommodation with the permanent 'bank' table and benches surrounding it. There was room to dance. Exploding with energy and sound the evening took off. Coupled began to dance all over the place. The music is what it is and it was what most of this audience wanted. Daptone Records has just completed their last album and ORQUESTA AKONAN's presence in Sydney may have the synchronicity element of a propaganda motive in delivering this sound for a world music appreciation. This Sydney audience, knew all about it and relished the chance to hear it live. I pined for the Ricky Ricardo orchestra - really the Desi Arnaz Orchestra - and wouldn't it have been lovely if Porto Rican Ricky Martin had made it, too. You can't have everything, can you?